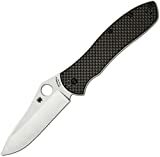 Hi Travis, I’m currently in the market for a heavy duty EDC for going into the military with, preferably Spyderco made as I have some credit with them. I’m curious if you would recommend this knife over the Paramilitary 2, or if there is another knife that you think would fit the task well. Congrats on joining the military. I was a Marine myself. I’ve never owned a Paramilitary 2, but looking at the comparison if I was going back into the military I’d go with the Paramilitary 2. The S30V steel the Paramilitary uses is a really freakin tough, and strength matters a lot with military knives. If you are deployed you can’t just ship a knife back to SpyderCo and have it fixed in a couple of weeks. The Bradley Folder is a fantastic knife, and I really doubt you’d break it, but why take the chance? The Paramilitary 2 also uses a flat grind, which is generally tougher than the hollow grind of the Bradley. The hollow grind just tends to be easier to get that razor’s edge on. The Paramilitary is also slightly cheaper. The G10 grips are a little more plain, and less flashy than carbon fiber. You really don’t need flashy, I just like it. There is also some minimal weight savings with the Paramilitary 2, which results in more than half an ounce. Likely not significant, but worth mentioning. Dude, nice review! I have been looking at 200 and under edc knives for quite some time. I didn’t even consider this knife till I saw your post. Now with this info I can surely say it’s going to be a Spyderco, just can’t decide just yet. Thanks for making my pick all the more fun. Carson, Thanks for taking the time to check out the review and leave a comment. It’s hard to go wrong with a Spyderco for EDC. Enjoy! I’ve bought this knife in the past but i’ve returned it for the low retention of the blade when it close…..very low!!! !